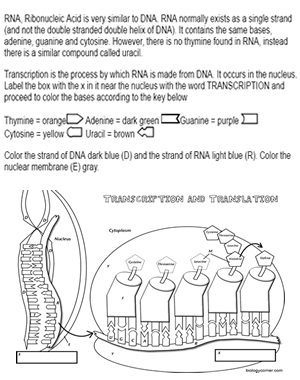 In this worksheet, students examine a graphic that models the process of transcription and translation. The model shows a double stranded DNA being used as a template for a single strand messenger RNA. The mRNA consists of codons that determine the sequence of amino acids on a protein strand. This worksheet can be used for basic and advanced students in biology and can help students understand the processes. Worksheet includes a coloring page, instructions with descriptions of the model and questions for students to answer.